Wicker furniture is one of the most widely used styles of outdoor decor. It is pleasant to look at and can be quite comfortable. Unfortunately, it can also get very dirty and worn. 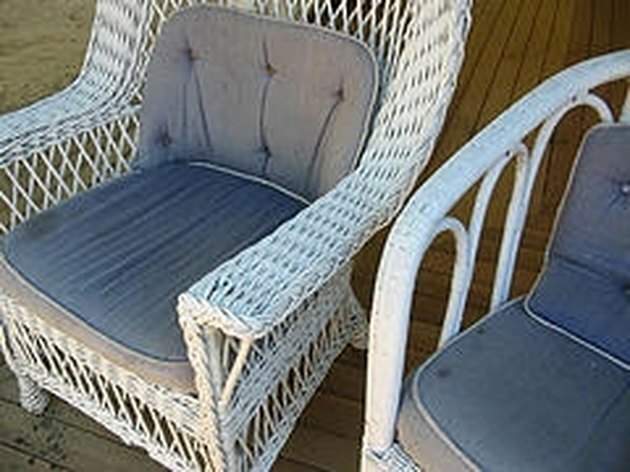 Keeping wicker furniture clean should be a part of your outdoor maintenance routine.Following these instructions will bring help bring your outdoor wicker furniture back to life. Remove all cushions from your wicker chairs and sofas. Using a garden hose, wash down the tops of all pieces. Turn the pieces over and wash down their undersides. Remove as much paint as possible. Go over the entire piece with a scrub brush. Using a toothbrush, scrub in between any reeds of cane that are exceptionally dirty. Do this on both the tops and bottoms of the furniture. Hose down each piece again. Check each piece for signs of mold. If any are apparrent, spray on a bleach-and-water formula and scrub with a toothbrush. Again, hose down each piece thoroughly. Allow to dry for 24 hours. When all pieces are dry, check for broken reeds. Using wood glue, glue any broken pieces back into place and allow to dry. Lay a painter's drop cloth on the ground and place each wicker piece on it. Spray-paint primer on the top of each piece. When dry, turn each piece over and spray-paint the primer underneath. Allow this to dry. Using the desired color of paint, spray-paint each piece of furniture, top and bottom. Allow to dry for at least 24 hours. If necessary, repeat by spraying a light second coat of paint. Finally, using a clear sealer, spray-paint each piece (top and bottom). Allow to dry for 24 hours before replacing cushions for use. Based in Florida, Rosemary Rugnetta has been a freelance writer since 2007 specializing in home and garden topics and real estate/mortgage. She is a former property manager and mortgage underwriter who writes for eHow and Answerbag as well as private clients. She has completed continuing education courses in writing, construction management and design.